1. Put rice noodles, soup powder, oil and vegetable into a bowl. 2. Pour about 400ml of boiling water, cover and wait for 3 minutes. 3. Stir well before serving. Ingredients: Rice Noodles (70.8%): Rice (42.9%), Starch, Thickener (Oxidised Starch E1404), Salt, Emulsifiers (Sodium Carboxymethyl Cellulose E466, Soy Lecithin E322). Soup (16.3%): Sugar, Salt, Starch, Spices, Flavour Enhancers (Monosodium Glutamate E621, Disodium Inosinate E631, Disodium Guanylate E627), Yeast Extract, Artificial Pork Flavour (Wheat, Soybean) (0.3%), Soy Sauce Powder (Wheat, Soybean), Squid Powder (Loligo Edulis), Anticaking Agent (Silicon Dioxide E551). Vegetable (1.8%): Soybean Protein, Dried Salted Cabbage (Soybean), Dried Carrot, Dried Spring Onion. Simply enter your details below and we will send you an e-mail when “Oh! 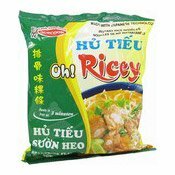 Ricey Instant Rice Noodles (Spare Ribs Flavour Hu Tieu) (越南排骨味粿條)” is back in stock!